Roku adds Search and My Feed features, launches Roku 2 streamer | What Hi-Fi? 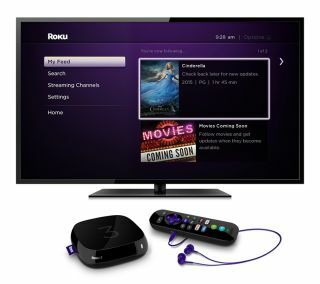 In its latest bid to stay at the forefront of video streaming, Roku has today added some new features to its products and released a new streaming box, the Roku 2. Users can now perform a software update on their Roku streamer to get two brand-new features, which both aim to make the job of finding something to watch that much easier. The first is Roku Search, which does exactly what it says on the tin. Users can search for movies and TV shows, plus actors’ and directors’ filmographies across a handful of services. For now, these only include Netflix and the lesser-known Snagfilms and Popcornflix, but more are expected to come onboard over time. We'd certainly hope to see Amazon Instant Video soon. Channels are also searchable, making it easier to find the one you want among the 1400 channels that Roku offers. Also new is Roku Feed, which launches with a focus on ‘Movies Coming Soon’ and allows you to tag films currently out in the cinema and follow them for updates. Roku will let you know when that film becomes available on a streaming service. After performing the software update, you’ll find the ‘Search’ and ‘My Feed’ tabs in the home screen menu. A new version of Roku's free app for Android and iOS has also been launched to incorporate the new features. Users can now, for example, perform a search through the app without interrupting what’s playing on the TV. Handy. Today also marks the UK launch of the new Roku 2 streamer. It claims to match the fleet-footed Roku 3 for speed and performance (good news), but comes with a less advanced IR remote that omits the Roku 3 wand's headphone jack for private listening. The Roku 2 is on sale for £70 at a number of retailers.